This week I fought what I will affectionately call the death flu. It started Thursday night with a mild sore throat and progressed quite rapidly into full blown flu. I had a temperature of 102 degrees and much of friday and Saturday is a hazy fog of my husband bringing me tea and helping me breastfeed. I was terrified Reuben would get it. 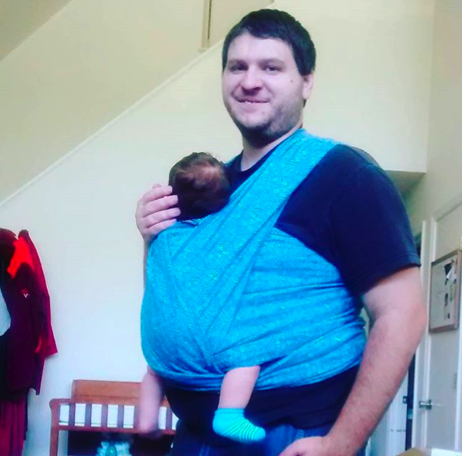 I was also completely incapable of taking care of him, so my husband held Reuben basically 24/7 when I wasn't feeding him and praying my antibodies would do their job and keep him safe. It was eye opening for both of us. It's Sunday now and I am in the post nasal drip part of my sickness, complete with with killer cough that kept me up this morning. My hands are so dry because I keep washing them before picking up the baby. But I feel a little less like death and I can stand up without feeling dizzy now, so I think I'm almost out of the woods. Reuben has not caught this yet, but who knows if he will in the next few days? I hope not. I am sure he would have to be hospitalized because it was bad. And he's only two months old. My husband told me yesterday he kept taking his temperature just to make sure he wasn't getting a fever. Last night Reuben slept for 7 hours, and it was amazing. I slept and I think the sleep really helped me recover. Probably what helped as well was the crock pot chicken noodle soup I made on Thursday when I started to feel ill. I still have a container of it in the fridge. There is nothing more scary then being sick and being physically unable to hold your kid. I had a sore throat, chills, and a fever, and I was freezing as well. I couldn't take care of Reuben and without my husband I don't know what I would have done. It was a completely humbling experience, and probably just as eye-opening for my husband who had to figure out how to take care of a sick wife and juggle a baby at the same time. When it was just us two, it was so much easier. I can't imagine what it would have been like if all three of us were sick at the same time. I feel like super mom in the fact that I can actually hold my kid today, although I have to be super careful not to sneeze or cough on him. I really don't want him to get sick. How are you guys doing? May the death flu pass you by... I never knew having kids would be this much of an adventure.